(November 2014 – Winter Park, FL) Neighbors Network is honoring National Family Caregivers Month by offering a complimentary gift for new members through December 23, 2014. Neighbors Network, an initiative funded by the Winter Park Health Foundation, is based on the nationally acclaimed Beacon Hill Village in Boston, which is designed to assist older adults who wish to live in their homes as they age, a concept known as aging-in-place. Neighbors Network memberships, for as little as a dollar day, can be given as gifts by adult children to their parents. Some of the volunteer services that can be requested for members include light garden maintenance, household organization, computer support, home paperwork filing, pet sitting, reading/sorting mail, personal visits, grocery shopping, personal correspondence and household tasks. Neighbors Network also offers social activities for members. Neighbors Network is currently operating in Maitland, Winter Park, Eatonville and close-by neighborhoods. National Family Caregivers Month was launched in November 1994 by the Caregiver Action Network, formerly the National Family Caregivers Association. Neighbors Network is a member organization for adults age 55+ in Winter Park, Maitland, Eatonville and the surrounding area who want to age at home with confidence. 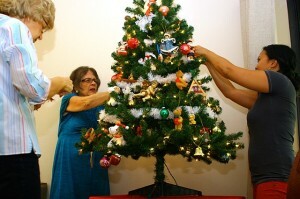 Through volunteers, screened service providers, and community partners, Neighbors Network provides the support that allows older adults to continue living and thriving in their homes and community (aging-in-place) “with a little help from their friends.” Visit neighborsnetworkfl.org/holiday.